Coverage: Watch live coverage via the BBC Red Button, Connected TV and online. There will also be extended highlights on BBC Two and all programmes will be available to watch on the BBC iPlayer. Full coverage details available here. For the majority of us, shuffling along wearing blue plastic skates at Christmas on a town-centre ice rink is about as close as we get to "figure skating". But in 1984, 23.95 million watched Torvill and Dean's iconic Olympic gold-winning Bolero routine and Britain's love of ice dancing took on new life. The reality is, no matter how many times we see clips of Gemma Collins on Dancing on Ice, watching the 'pros' whizz around a rink can seem a blur of twizzles, Besti squats and toe loops. 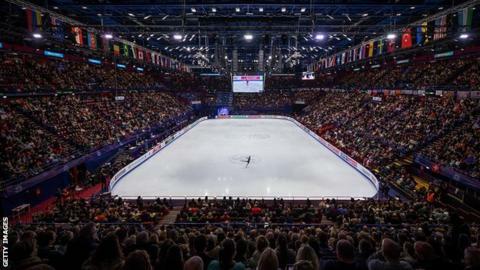 In the build-up to the World Figure Skating Championships, which begin on Wednesday in Saitama, Japan, BBC Sport is giving you all the help you need to make sure you fully appreciate the beauty, grace and fearlessness of the world-class athletes. There are four medal events at the World Championships: the men's, the women's, the pairs and the ice dance. What's the difference between a 'short' programme and a 'free' programme? Once you've got the grasp of this, it makes things slightly easier to consume. The 'short' programme is generally slightly more technical and requires competitors to perform certain selected moves in order to build their score. Then there is the long, or 'free' programme, which gives competitors more flexibility to showcase their strengths with a longer routine. Each competitor performs both and their scores are added together to give overall results. Got it? OK. Let's move on. British former Olympic champion and BBC commentator Robin Cousins explains what we should be looking for in a gold medal-winning performance. "It's all about the quads - the quadruple jumps," he says. Cousins adds: "There are some skaters who can hit five or six in a routine, but I would much rather see just three perfectly executed quads within a beautiful performance (or programme, as the pros call it)." In the men's competition, there are seven or eight skaters who are fighting for the top three positions. "There are of course the home favourites Yuzuru Hanyu (aka Yuzu) and Shoma Uno - Olympic gold and silver medallists - but Yuzu has been suffering with an ankle injury so I am hoping Uno turns up on the day," adds Cousins. "He has been skating beautifully and for such a young skater (he's only 21), he really rises to the occasion". Elsewhere, America's 19-year-old Nathan Chen, who is studying at the prestigious Yale University, landed a staggering five quads at the Pyeongchang Olympics to put himself firmly in contention. Britain's representative is Peter James Hallam - 'PJ', as Cousins calls him. "He has a great presence on the ice and is a real crowd pleaser. He has no quads but has had a really good last season and is just an all-around good egg," says Cousins. It's Olympic gold v silver again with the battle of the Russians - Alina Zagitova and Evgenia Medvedeva. In 2018, Zagitova - at the age of 15 - became the youngest female Olympic figure skating champion since 1998, beating fellow Russian and two-time world champion Medvedeva in the process. Japan's rising star Rika Kihira, 16, is also one to watch, as is Kazakh Elizabet Tursynbayeva, 19, who is one of only two female skaters with a quad in their repertoire. Three-time British champion Natasha McKay, 24, is hoping to make her mark on the world stage after a couple of good results last year. "She is a solid performer but the standard in the women's competition is so high, she may struggle to make the top 10," says Cousins. What's the difference between pairs and ice dance? Ice dance is just that - "ballroom dancing on ice". An ice dance couple can skate to music with a beat and lyrics and often use contemporary tracks you will recognise from your playlists. There are no throws, no high lifts, no jumps and certainly no "death spirals", but there are twizzles and step sequences, and ice dancers must stay no further than two arms' lengths apart. Twizzles involve the skaters spinning in complete synchronicity. Pairs, however, is choreographed to classical music and judged on the skaters' ability to perform lifts (above the male skater's head), side-by-side jumps and anxiety-inducing throws. The 2019 European champions Vanessa James and Morgan Cipres from France are the ones to beat in the pairs. But they will have competition from Olympic silver medallists Wenjing Sui and Cong Han (China) and 2018 world silver medallists Evgenia Tarasova and Vladimir Morozov (Russia). British pairs champions Zoe Jones and Christopher Boyadji return to the World Championships for the third time, having finished 10th at the European Championships in January. Jones is a remarkable anomaly in the figure skating world, still competing on the world stage at the age of 39. "Zoe fell out of love with the sport and took some time away from skating herself, but carried on coaching," Cousins says. "In figure skating, you can only work as hard as your body will allow and Zoe has worked incredibly hard. I am so in awe of what she has done. "With three children, including twins, she has been a brilliant role model to the skaters coming up. She is quiet and calm in real life but on the ice, she becomes a fierce woman." The top Britons are ice dance pair Lilah Fear and Lewis Gibson, who train in Canada and finished sixth at the European Championships in January. "Lilah and Lewis are certainly capable of reaching the top 10," Cousins said. 2018 was Gibson and Fear's breakthrough year. In October, they were invited to compete at Skate America, the first event of the ISU Grand Prix calendar. They finished fifth in a field that included World Championship medallists, before going one better at the NHK Trophy in Japan in November. At the latter, they placed second in the free dance section to a standing ovation. "They jumped on to the international scene strongly recently and are so entertaining to watch. Their free programme is disco-inspired and features Michael Jackson's Don't Stop 'Til You Get Enough," he added. A leg position in which the free leg is extended behind the body in a straight line. This is the leg position used for the basic camel spin. The only jump counted as a jump element that starts from skating forward. An axel jump has an extra half rotation (180 degrees), and as with all jumps is landed with the skater gliding backwards. It was named after Axel Paulsen. A spread-eagle like move where the skater glides on two outside edges with knees bent. It is named after Natalia Bestemianova. A spin position during which the free leg is extended in the air in an arabesque position parallel to the ice. Two or more elements (jumps, spin positions) performed in succession. Crossing one foot over the other as a way of gaining speed and turning corners. Type of lift where the lifter may not raise his arms above his shoulders. (Ice dance). An element in pairs skating in which the woman skates on a deep edge with her body close to the ice and skates in a circle around the man, who is in a low pivot position and holding her by the arm. The leg that is not on the ice. A sequence of edges, turns, and hops. Often a required element. The area next to the rink at major competitions where the skaters wait to get their results. An edge jump that takes off from the back outside edge. A toepick-assisted jump with an entrance from a back outside edge and landing on the back outside edge of the opposite foot. A jump with four full rotations (1440 degrees) in the air. An edge jump that takes off from the back outside edge. The jump is named after Ulrich Salchow. A rotation upon the ice surface. Spins are performed on the round part of the blade, just behind the toe pick. A series of footwork and field moves performed during a programme. A toe-assisted jump that takes off from the back outside edge. A quick multi-rotational turn on one foot while moving forwards or backwards. An upright spin position in which a skater pulls the free leg up into a vertical split towards the side of the body, creating a Y shape. How to get into curling - an intricate, tactical back-and-forth game on a sheet of ice, accessible to all ages. How to get into ice skating - find a rink near you and start gliding across the ice. Learn how to get involved in ice hockey to put your skating and hand-eye co-ordination to the test. How to get into skiing - a full-body workout, guaranteed to get you fitter, with slopes and centres across the UK. Latest news and results from the official site.